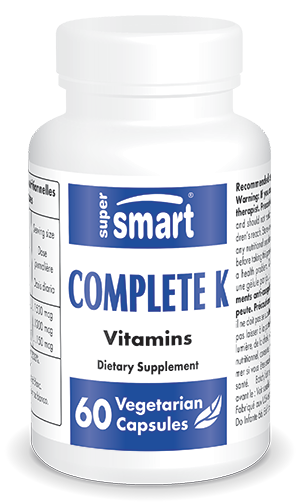 Based on the 3 most bioavailable forms of vitamin K.
Helps activate certain coagulation factors. May play a role in preventing cardiovascular disease and osteoporosis. The term vitamin K covers various substances that play a part in activating certain coagulation (or ‘Koagulation’ in German) factors. Having reached the lymphatic vessels, vitamin K is taken up by chylomicrons and accumulates in the liver where it participates in the synthesis of four coagulation factors, including factor II (prothrombin) and its conversion into thrombin. Up until the last few years, it was thought there was only one form and one active family of vitamin K, represented by vitamin K1 (phytomenadione or phylloquinone). This is the form found primarily in plants and cruciferous green vegetables such as cabbage, parsley, spinach and lettuce. It is fat-soluble and heat-stable but sensitive to light and alkaline environments. Other forms of vitamin K, essentially vitamin K2 which is divided into two forms – MK4 and MK-7, have recently been the subject of important studies which have highlighted new properties beyond the well-established role in blood clotting mechanism. Menaquinones (vitamin K2) are synthesised by bacteria in the intestinal tract, but they are unfortunately totally eliminated in faeces rather than distributed to vessels, bones and various tissues. K2 vitamins are also found in offal, meat, fermented products such as certain cheeses, and especially natto, a traditional Japanese food made from fermented soybeans, which is by far and away the richest source of vitamin K2 but is unfortunately not part of the Western daily diet. It is now known that vitamin K2 remains active for a long time in the body (up to 72 hours), at very low doses, while being ten times more bioavailable than vitamin K1, and that it acts synergistically with a number of nutrients such as vitamin E and calcium. There is also a synthetic form, vitamin K3 (menadione) which is rarely used since it interferes with the cells’ antioxidant defences and can cause oxidation of cell membranes. In babies, it can destroy red blood cells, leading to anaemia. Those wishing to supplement with vitamin K should therefore do so with both the K1 and K2 forms. The MK-4 fraction of vitamin K2 is very similar to vitamin K1 which the body is capable of converting into MK-4. However, the latter has a biological half-life of barely an hour, and is therefore not a good supplement to take alone. The MK-7 fraction, on the other hand, has a half-life of three days, ensuring stable blood concentrations and enabling low doses to be taken with no cumulative effects. Natto is one of the primary sources for extraction. However, the biological role of vitamin K2 extends still further. It moves calcium into tissues where it needs to be – the bones and teeth. In activating synthesis of osteocalcin, a specific hormone of bone tissue produced by osteoblasts, it ensures mineralisation by capturing and redistributing calcium within the body to the bones and teeth. It therefore reduces osteoporosis-related bone fractures (particularly broken hips). Conversely, it removes calcium from parts of the body where it shouldn’t be, such as the arteries and soft tissues where it can cause hardening. By so doing, it protects such tissues from eventual calcification in the form of atherosclerosis and aortic calcification. And finally, it supports healthy functioning of the renal system by preventing calcium type kidney stones. A study published in the journal ‘Modern Rheumatology’ has also shown that vitamin K2 may improve symptoms of rheumatoid arthritis, while other research suggests it can help maintain normal ATP production in mitochondrial dysfunction such as that related to Parkinson’s disease. While deficiency is rare in adults, it is more common among new-born and premature babies, and can also affect elderly individuals with intestinal malabsorption problems or osteoporosis. Pregnant women also have greater vitamin K requirements, as do breast-fed babies. Having said that, research by Dr Rhéaume-Bleue has revealed that 80% of Americans are deficient in vitamin K2, potentially leading to brain disorders, cancer, stroke, kidney stones or osteoporosis. • those at risk of cardiovascular disease and cancer. And scientists at Maastricht University have even demonstrated that many healthy people are lacking in vitamin K and that supplementation may be beneficial for those aged over 40.
adults. Take one capsule a day. Attention: If you are taking anticoagulant drugs, consult your therapist before taking this product.